There is surprisingly a lot more to bringing birds to your backyard feeder that you’d think. Some like to feed on the ground, some like to feed off the ground, some like insects, some like a special sort of seed, etc. Here are some helpful tips to bring as many birds to your feeders as possible. Elevated Feeders: Some birds like the Tufted Titmouse, Red-bellied Woodpecker, and Brown-headed Nuthatch like to feed on food sources they can find in the trees. People can mimic this behavior by installing Tube Feeders, Hopper Feeders, or Suet Feeders. Ground Feeders: While some species of birds feed exclusively in the trees, there are some that venture to the ground to feed. Birds like Cardinals, Mourning Doves, various Sparrows, and even Ducks will come to Ground feeder trays or platform feeders that are set on the ground in a place close to cover if it’s needed. Suet Feeders: Suet is a formulation of animal fat and other ingredients, like insects, to attract birds and provide a food source high in energy. Birds like Woodpeckers, Warblers, Chickadees, Titmice, Nuthatches, and Wrens all incorporate suet into their diets. We have various types of suet here at Wingard’s Market that cater to different birds and their requirements. Insect Feeders: Some birds will feed primarily on insects and worms like Eastern Bluebirds. To attract them, place hanging tray feeders full of mealworms. Mealworms provide a high source of energy and protein. Native plants, those that occur naturally in a landscape and are native to a particular area, also help in attracting wildlife. Wildlife prefer to feed, nest, and seek shelter in native plants than many plants we use to make our yards look nice. Below is a link to South Carolina Wildlife Federation’s list of native plant species that you can plant in your yard. If you are a pet owner this could potentially affect the wildlife and how they behave in your yard. Dogs and Cats kill BILLIONS of wildlife every year. 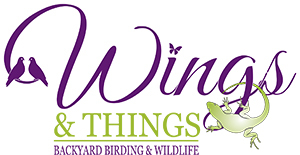 Zach and the staff of Wingard’s Market hope to add another dimension to creating a beautiful backyard living space with the addition of Wings & Things.